There has been quite a bit of controversy as to whether or not power lifting competitions should be held and who should govern these lifts. I served on the first committee for power lifting appointed by Mr. David A. Matlin, National AAU Weightlifting Chairman. The purpose of this group was to make a study of the situation and report to the National Committee which met just prior to the 1963 Senior National Weightlifting Championships held at Harrisburg, Pennsylvania, which we did. One thing that I discovered for sure was that as long as man lives upon this earth, strength will be admired. To develop strength one must practice the power lifts and probably the King of these lifts is the dead lift. Ask a man who knows nothing about a barbell to perform a lift to measure his strength. He will not attempt to press, curl or squat with the weight; he will assemble the plates on the bar and proceed to lift the bar clear of the floor and stand erect. This type of lifting is the most natural way of performing a strength test. In traveling from my home in California to Harrisburg, my son and I went by way of Johnson City, Tennessee and visited with Bob Peoples and his family for a few days before and after the contest. Driving form Johnson City along with John Summers and Peoples, to Harrisburg, observing the two days of lifting and returning to Johnson City, allowed us much time for discussing our sport, a sport that we love. It was then that I realized that many of Bob’s training innovations, pieces of equipment and methods of performance were still unknown to a vast number of power lifters. Peary Rader gave clearance to write this article and here I am sitting on the Peoples’ porch early in the morning drinking in the beauty of forested, rolling East Tennessee country. As I pen these words that I am sure will be helpful, and watch a fox scamper across the pasture, I’m reminded of what an ideal setting this is to train in; a place of stability and opportunity where rugged mountain folk still like to earn their living by the sweat of their brow and to be fee to think for themselves and worship God in their own way. I attended services at the Sinking Creek Baptist Church last night. It is the oldest in Tennessee; a part of the original building which was built in 1783 is still standing and is a part of the old historic shrine. It was among these settings that Bob Peoples was born and grew up as a boy across the road from where his grandfather was raised. 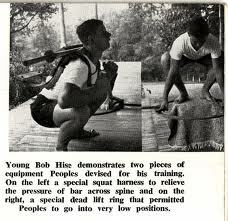 Bob’s father, as a young man, was interested in strength. It was with his father’s 50 pound dumbbell that Bob started training at the age of 9. A Farmer Burns course of training was purchased when Bob was 15 and he followed this very diligently for three years, at which time Physical Culture Magazine published an article on barbell training. This article was written by David Willoughby and was very well illustrated. The story helped to steer young Peoples forward on his quest for great body power. Another media which helped Bob greatly was “Strength Magazine.” It was read avidly until the publication ceased in the early thirties. Peoples has been a regular subscriber of most all the magazines and has just about every copy of the periodicals that have been published. Through the pages of Strength, Bob learned of the Olympic lifts and the power movements also. By the time Bob had reached the age of 18 he had become very interested in the dead lift. He did all around training, but his specialty from this time on was his pet, the deadlift. He made a lift of 350 and in a year had worked up to 450 at a bodyweight of 165. His first competition of any kind was the 1937 Tennessee State Weightlifting Championships. The nest two years of training brought much improvement. Again he traveled to Chattanooga and lifted in the 1939 State Championships. His total had improved 65 pounds but the highlight of this occasion was a deadlift of 600 pounds. After this performance of deadlifting, Bob returned home and did some of the most serious training of his life, only to have his gains swept away by a serious illness that resulted in a major operation. Bob was sent to Fort Oglethorpe, Georgia Induction Center and it was there, after several days of medical examinations that it was discovered that a kidney tube was obstructed. Fortunately this condition was discovered before too much damage had occurred. As Bob was told by the Army Medics to see his private physician, he did so on his arrival home. After a consultation it was decided that Bob should make a trip up to the famed Oschner’s Clinic in New Orleans. bob made the trip and this serious kidney operation was performed there. The incision was about 18 inches long, reaching from the center of the back to just below the front center of the lower rib. Bob returned home to convalesce; the worst part of the recuperative process was the ever-present thought that there would be no more heavy lifting. After all, that was the verdict laid down by Dr. Oschner. About six weeks after surgery Bob did a little light work on the weights. This convinced him that he should do more training. We hear so much about isotonic and isometric training and many have trained by these non-movement and short movement types of exercises. This method of training, as we have read, has played an important part in developing some of our modern day lifters. Bob built a rack somewhat similar to our present day isometric racks. The uprights were made of 4”x4” hardwood and attached to the floor and overhead beams. These uprights had 1 1/8” by 3” holes drilled in them. Bolts 1”x 8” could be inserted in these holes. At first Bob used this device to work on the press and lockout on his jerks, but his foremost love being the deadlift, he turned his direction of work in this area. Three methods of training were performed on the uprights. 1.) The bar was loaded with an excess of his best deadlift poundage and partial movements were executed at various positions. Most work was done at positions of just below knees, knee height and just above the knees. 2.) Take weight from the uprights and lower to the floor and stand erect. 3.) A complete static (isometric) exercise in various positions. Bob felt that he needed more basic starting strength and devised a ring with short extensions by which to hold and to add weight. By standing on various height objects he was able to develop tremendous sub-starting power. By this time Bob was using such heavy weights that it became more and more difficult for him to hold the bar while doing repetitions in his various exercises. He engineered hooks to facilitate gripping of the bar. These were the forerunner of the straps that are commonly used today. Peoples had completely overcome his post-operative and convalescing period by breaking his personal deadlift record. At the 1946 Tennessee State Weightlifting Championships he surprised the world by doing 651 ¼ pounds in the deadlift. Bob returned to his East Tennessee farm and came up with other innovations that helped gain even loftier heights in the deadlift. The continuous heavy training would sometimes leave his joints stiff and sore. Bob invented another gimmick, a sponge rubber was soaked with a good liniment and placed on the knees, back, or other sore area and secured in place by wrapping with a bandage. This not only was soothing, but allowed harder workouts with no discomfort, which facilitated further gains. Our deadlift champion began to study his body leverages and gravity centers. He would take a bar in a starting deadlift position and view himself an a mirror and notice by the raising or lowering of the bar as he changed grips, using different height shoes, inhaling slightly, inhaling heavily, exhaling slightly, exhaling heavily and observing the positions and conditions that suited him best. He decided that the best position for him was rounded back, palms forward, hook grip and to lift barefooted and with a completely exhaled thoracic cavity. With this new knowledge and much training under his belt, Peoples journeyed to Chattanooga to take part in the 1947 “Mr. South” contest and variety show. This event was staged annually by the Central YMCA during the month of October. Top stars were invited to perform in their special events. As the crowd cheered and Bob heaved and tugged, the stupendous weight of 699 pounds cleared the floor and inched its way upward until it became fixed by Bob at the completion position. Another record to his credit, but this wasn’t all; the newspaper photographer failed to get a picture, Bob went back stage and obliged the press photographer by lift the same weight a second time. It seemed that Bob had discovered magic formulas – each time he performed the record would go up. As he trained somewhat along the lines of previous training and making a few changes here and there he became progressively stronger. Though Bob had always done some squats, he now embarked on a concentrated course of deep knee bends. His back being very strong, he noticed that coming up out of squats he would do a type of exercise which was between a knee bend and a good morning movement. A shoulder apparatus was built to support weight and facilitate the exercise. This and quarter squats plus taking heavy weights from the racks and doing rapid deadlifts by bouncing the weight off the floor increased his strength a great deal more. An invitation to appear on the Nashville YMCA Variety Show program was accepted. The show was held in December of 1947. “Pudgy” Stockton was billed as the headline but after Bob deadlifted 710 pounds she was pushed back into the background. March of 1948 found Bob lifting 704 pounds in Detroit. This was the first time that he had performed in public without making an increase in poundages lifted. he did clear the floor with 719 pounds and just failed to stand erect with this weight which would have been a record. The grand climax of lifting came to John Robert Peoples Jr. during the great Red Shield Boy’s Club Variety Show of 1949. What an opportunity – that of being able to perform before an enthusiastic hometown crowd. A hush fell over the Johnson City Auditorium as Bob approached the bar with a yell from an old Tennessee Mountaineer, “That’s our man – come on Bob, I know ye can lift that dang weight!” It seemed like an eternity before the barbell left the floor. Up, up it went and with a final heave mighty Bob Peoples stood erect to one of the most thunderous applauses that I ever heard. The lifter weighed 181 pounds and the weight scaled 725 ¾ pounds.